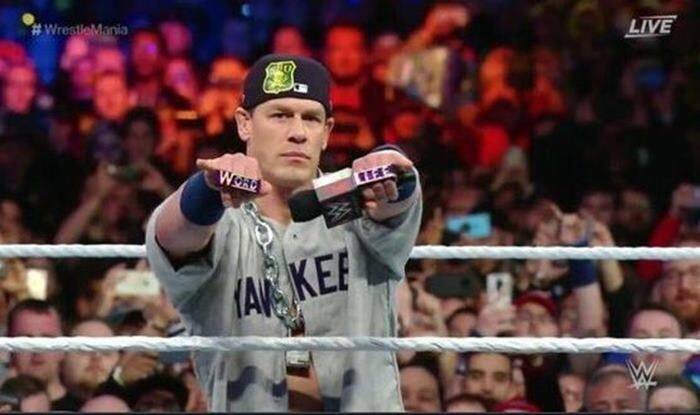 World Wrestling Entertainment (WWE) superstar John Cena has made a surprise return at Wrestlemania donning his old 'Doctor of Thugonomics'gimmick, which has sent the fans in a frenzy. World Wrestling Entertainment (WWE) fans were taken by surprise as former 16-time world champion John Cena made his unexpected entrance in the Wrestlemania event at the Metlife stadium in New Jersey. Donning the gimmick of ‘The Doctor of Thugonomics’ from the early days of his career in the profession, Cena appeared in a segment where he interrupted wrestler Elias, who was performing a song in the ring. He delivered a freestyle rap insulting Elias which was met with the rapturous applause of the audience. Following this, Cena wrapped it up by executive his finishing maneuver labeled as ‘The Attitude Adjustment’ on Elias sending the fans wild at the stadium. Throughout his illustrious career, Cena has appeared through different gimmicks which has captured the imagination of the WWE universe, but the ‘Doctor of Thugonomics’ was one of the most resounding profiles and the fans received it as quite a throwback. Nah, I’m not really feelin’ it. The Wrestler-actor did not have a match in the event because he is currently shooting for one of his upcoming movies in Hollywood. Recently, his movie ‘Bumblebee’ was released and he is engaged in a few more projects. John Cena has a close affiliation with rap and even his own entrance song ‘My time is now’ is sung by himself among several other tracks.